Jaws automatically adjust within a 4 In. range --- 2 In. x 2 In., 1 In. x 3 In. etc. The BORA WTX Clamp Edge and Saw Guide kit is the perfect addition to your toolbox. The durable WTX Clamp Edge is made of tough heavy-duty extruded aluminum, allowing it last many years of use. The adjustable end clamp slides easily along the precise channels, eliminating the need for the internal channel bar. The WTX Saw Sled easily attaches to your circular saw and glides smoothly over the WTX Clamp Edge to make track saw like precision cuts at a fraction of the price. Works with right or left handed circular saws. 90 Degree Angle Clamp, Single Spindle The BESSEY WS-3+2K is designed to clamp work pieces together at a 90 degree angle. The pivoting jaw adjusts automatically to different thicknesses of wood. Comes standard with a pair of TK-6 table clamps to use when you want to clamp your WS-3+2K to a work surface. 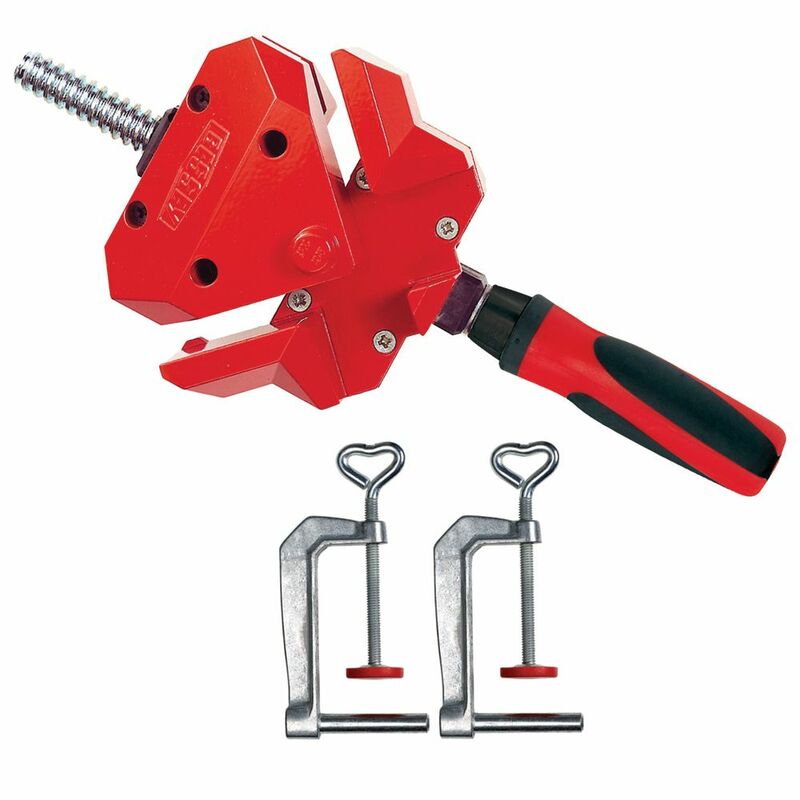 90 Degree Angle Clamp, Single Spindle is rated 4.1 out of 5 by 152. Rated 5 out of 5 by DWWoodworks from Great holding power with great view to see if joint... Great holding power with great view to see if joint is properly aligned. Rated 2 out of 5 by Ben from Three was no instructions on how to use. ... Three was no instructions on how to use. Rated 5 out of 5 by sprintcar from Awesome clamps, the best I've used ever! ... Awesome clamps, the best I've used ever! Rated 2 out of 5 by Renee from They are over-priced! These clamps may be ok for holding "dry" "T" joints, but have a lot to be d... They are over-priced! These clamps may be ok for holding "dry" "T" joints, but have a lot to be desired for miter joints. I bought four of them with intent to glue together some picture frames because of the greater vertical depth. The framing material was 1 1/2" wide x 1" thick. When opening the jaws to accommodate this material, the movable jaw moved off of the flat surface of the fixed portion and would "float" at odd angles, making it difficult to align the pieces. Additionally, with the joint laying on the flat portion of the fixed jaw, there was no access to the bottom side to clean of any excess glue before it set. Another negative feature is that there are no countersunk holes in the fixed jaw to fasten the clamp(s) to a heavy plywood piece or bench top. The holding clamps provided were useless in holding the clamp assembly at any angle other than at 45 degree angle to a bench top. I still have not figured what the purpose is for, and how to use, the plastic "T" inserts that fit in the jaws. With them installed, you cannot even drill screw holes for a "T" joint. Rated 5 out of 5 by Thomas from I love it. I have several other 90degree clamps but... I love it. I have several other 90degree clamps but this one is very rugged and sturdy and holds with a lot of force. Rated 3 out of 5 by KenM from I was disappointed with this corner clamp. It has a... I was disappointed with this corner clamp. It has a thick base and you'll need to build support blocks for your workpiece. I recommend having some wedges handy.